The day got off to an early start with everyone opting for an early morning dip in the lake. Tom's gay alarm clock was enough to get him and John there but sadly no one else bothered to turn iu, in fact Damo even missed breakfast. Damo was still very much in form during the morning visit to Desenzano market; choosing to buy a potion of olives although he was attracted to what he thought were chillis which in fact were tomatoes on the vine. 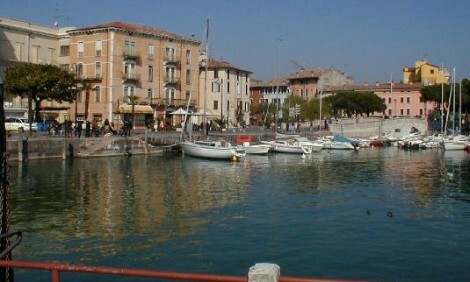 Lunch was taken in Sirmione, where Dan had ice cream, followed by pizza, followed by more ice cream. John decided against a pizza until one minute before the ferry was due to leave and then disappeared to stuff his face with a slice of tonno and almost missed the ferry. The ferry arrived in Bardolino but we were struggling to get to the game until Chris came to our rescue by providing a car shuttle service to get us all there to the remote location. The evening following the game proved an eventful one for Martin who was mixing his red wine and beer and fell asleep in the town square before recovering to continue drinking. On returning to base, Mezza then brought the hotel to a standstill by trying to smash down Damo's room door. It wakened the entire hotel except Damo, somewhat intoxicated himself, who slept through whilst Tom and myself rolled about laughing as John, in teacher mode, described it as ridiculous. It was Milan next, a quieter day I'm sure it will be.